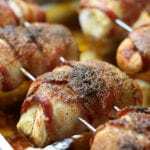 This Bacon Wrapped Chicken recipe creates incredibly moist and flavorful meat with the added bonus of being stuffed with cheese. Comes together very quickly and disappears even faster. 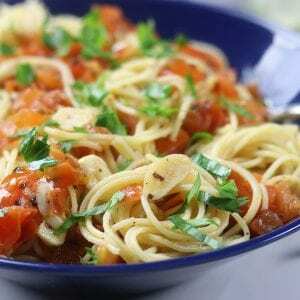 Have you ever had one of those moments where company is coming and you want to prepare a nice dinner but are low on time and energy? I have even had moments where I really wanted to make a nice meal for my husband but just couldn’t figure out what to cook. 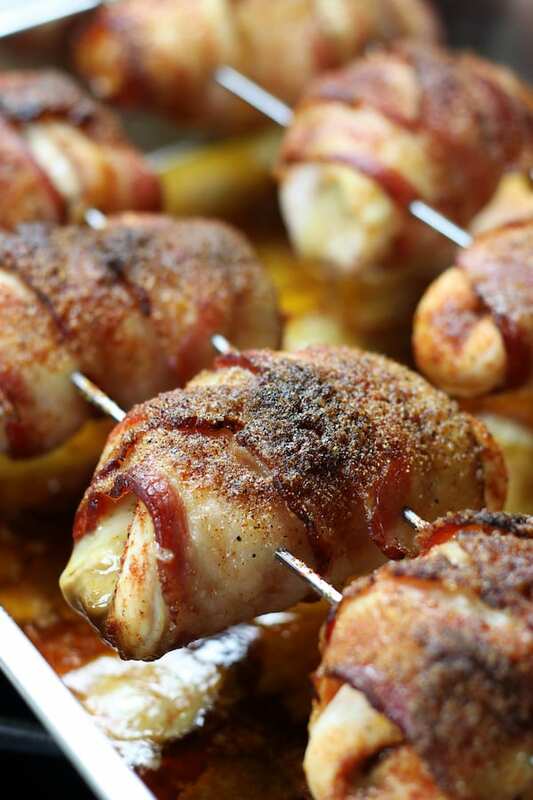 This Bacon Wrapped Chicken is absolutely the answer. My husband, who is not a huge chicken lover, proclaimed to me first, he adores the Dry Rub used with these breasts and secondly that this is a really good way to get him to eat chicken. I have to admit that I agree with him. 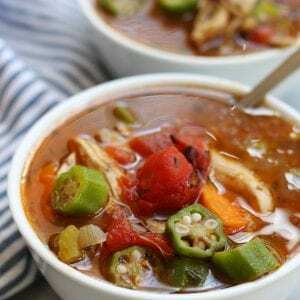 This recipe creates chicken meat that is so moist, packed with flavor and so easy to prepare. Honestly, every time I have used the dry rub in recipes like Dry Rubbed Grilled Chicken Sandwich, Best Ever Dry Rub Chicken Wings and Best Dry Rubbed Ribs Of Your Life everyone goes crazy over it. 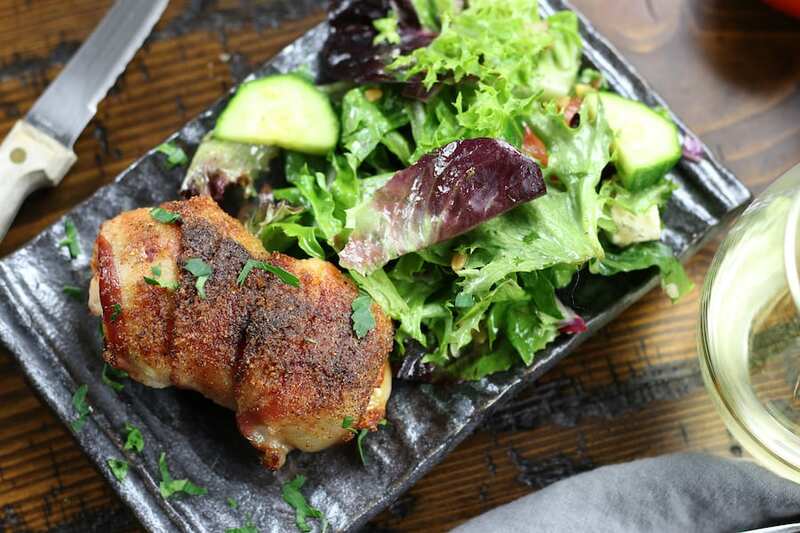 With summer right around the corner, this Bacon Wrapped Chicken is going to be my go-to recipe for an easy and scrumptious meal. Cut boneless skinless chicken breasts into cutlets by laying the breast flat onto a cutting board. Using a sharp knife, place one hand onto the top of the breast and cut at the center horizontally through the breast with clean even strokes. You may need to make a few additional cuts to create 2 individual cutlets from 1 breast. Place cutlets between two pieces of parchment paper and using the flat side of a Meat Tenderizer (or cast iron pan) pound chicken cutlets so that they are an even thickness. Remove top layer of parchment paper and sprinkle cutlet with Dry Rub (only on one side). Place string cheese that is cut in half at one end of cutlet and roll chicken breast. Starting at one end of the rolled cutlet, wrap 1 slice of bacon around cutlet. The first slice of bacon should end at the center of the cutlet. Wrap second slice around remaining unwrapped cutlet. Sprinkle remaining dry rub over the top of rolled cutlets. My favorite approach is to thread each rolled, bacon wrapped chicken breast on 2- 15 inch BBQ skewers, 3-4 pieces per skewer. Place ends of skewers over the edge of sided roasting pan and bake for approximately 40 minutes. This approach allows for the grease to drip into the pan while hot air can circulate around chicken. Another approach is to bake on a baking rack, allowing the grease to drip into the cookie sheet. A word of caution with this method, watch carefully that the bacon grease does not spill over the sides of the cookie sheet. Lastly, grill on medium- medium/high (about 375℉) using this tool to allow easing turning halfway through. Is this recipe the same as Bacon Wrapped Candied Chicken? Yes and no. Since the dry rub has brown sugar, it does create a beautiful candied topping on top layer. However, Bacon Wrapped Candied Chicken is an appetizer with bite sized pieces of chicken and bacon. Can I use chicken thighs for this recipe? Bacon wrapped chicken thighs would be absolutely delicious, but for this recipe breasts work best. Most importantly, it is best not to use thick cut bacon. An average thickness on the bacon will crisp the best with this recipe. Secondly, buy the best quality of bacon you can afford, ideally with no nitrates, no antibiotics and organic if possible. Will Monterey Jack Cheese work well in the chicken breast? Cheese that is softer, like Monterey Jack, although very tasty tends to melt out the sides of the chicken cutlet. Sticking with a firmer cheese, like string cheese, will help keep most of the cheese inside the chicken. How do you reheat this chicken? 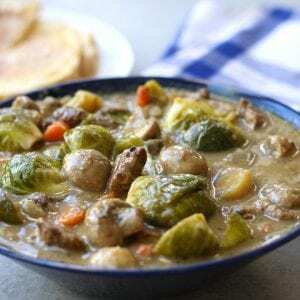 To reheat either microwave or bake at a low temperature. To microwave place an individual piece on a microwave safe plate. Reheat for approximately 2 minutes on power level 8. It is always better to start with less time and to work your way up to ensure the chicken doesn’t become tough and overcooked. 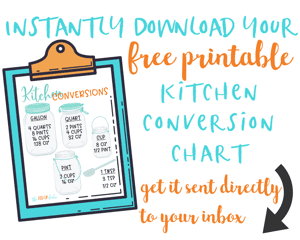 Start with 1 minute and add on 30seconds increments. To reheat in the oven preheat oven to 300℉ and place chicken in a sided pan. Bake for approximately 15-20 minutes or until heated to desired warmth. 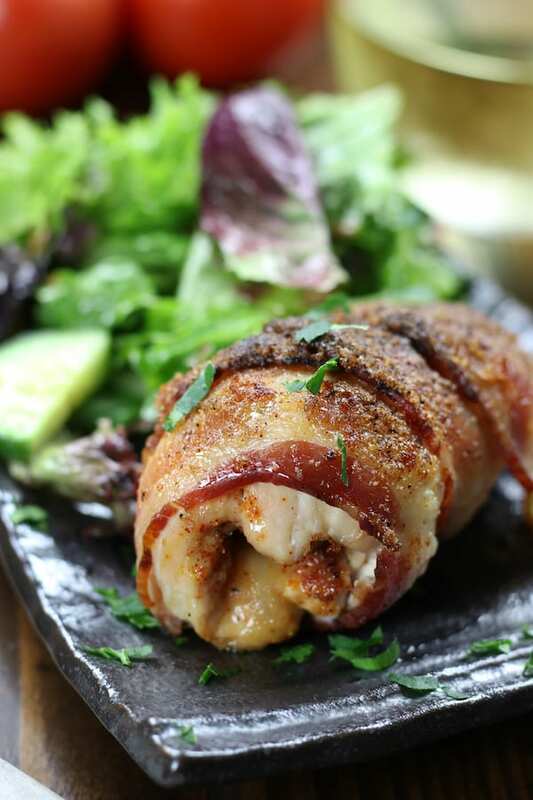 Bacon Wrapped Chicken recipe creates incredibly moist and flavorful chicken with ooey gooey cheese in the center. This chicken is not only easy, it is perfect for company. Prepare dry rub and set aside. Cut each chicken breast into 2 cutlets (see detailed notes above). Place each cutlet between 2 pieces of parchment. Using a mallet pound breasts into even thickness, about 1/2 inch. Sprinkle dry rub over the top of cutlets, reserving about 1/3 cup for bacon. Place cheese stick half at the end of chicken breast cutlet and roll. 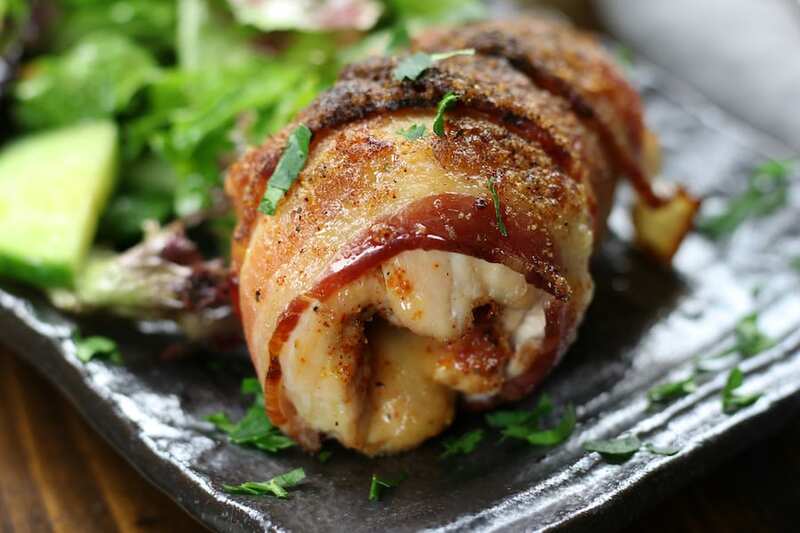 Starting at one end, wrap a slice of bacon around rolled chicken ending in the center of chicken. Continue with a second piece of bacon. Thread chicken piece onto 2- 15 inch BBQ skewers, 3-4 pieces per skewer. Bake for approximately 40 minutes. Let rest for 5 mins. Chicken is done when no pink remains and juice runs clear when cut.